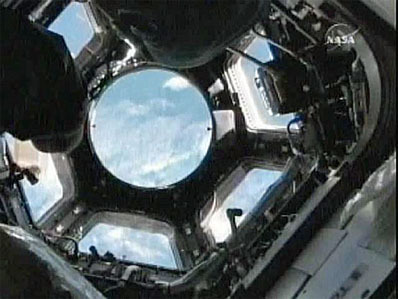 The Endeavour astronauts cranked open aluminum shutters protecting the windows in the space station's new observation deck early Wednesday, giving the crew inside an "absolutely incredible" vista of the Earth 220 miles below. Spacewalkers Robert Behnken and Nicholas Patrick first removed insulation blankets from the cupola's seven windows late Tuesday and unbolted launch locks holding the aluminum shutters in place. "Terry and Kay, you are clear to open window number seven for a shutter check and get the first view out the cupola," Endeavour commander George Zamka called just after midnight. "I see it opening," Patrick said from his perch outside. Live television views showed the disk-like shutter smoothly rotating open and out of the way. Earlier in the spacewalk, Behnken and Patrick activated a second ammonia coolant loop for the Tranquility module, removed a no-longer-needed keep-alive heater cable and connected power and data cables to a pressurized docking port on Tranquility's outboard port. They then made their way to the cupola to remove the insulation and launch locks. There were no problems of any significance and the cupola's systems appear to be working normally. "Our wakeup music today on Endeavour was Jimmy Buffett's 'Window on the World,'" astronaut Steve Robinson observed. "I think that came from Kay's family." The spacewalk officially began when Behnken and Patrick switched their spacesuits to battery power at 9:15 p.m. EST. "Bob and Nick, have a tremendous third EVA," Zamka radioed the spacewalkers. "You guys are doing great work so far, let's get that other cooling loop fired up for node 3 and let's take the covers off (the cupola)." The five-hour 48-minute EVA ended when the spacewalkers began repressurizing the space station's Quest airlock at 3:03 a.m. Wednesday. "Hey Bob and Nick. Welcome back to the airlock," astronaut Kay Hire called. "Great job raising the curtains on the bay window to the world." Before re-entering the space station, Behnken and Patrick thanked flight controllers and their trainers. "Thank you very much for those kind words, we all appreciate it," said Hal Getzelman in mission control "Right now, we're admiring your handiwork and I'm sure you guys are going to appreciate looking from the other side of the cupola out." "We are looking forward to that," Patrick agreed. This was the 140th spacewalk devoted to station assembly an maintenance since construction began in 1998 and the third for the Endeavour crew. Total station EVA time now stands at 873 hours and 16 minutes while the total for Endeavour's mission is 18 hours and 14 minutes.